We love experimenting with different ways of presenting our flowers and including keepsake gifts that the recipient will be able to use again when the blooms are past their best. We really liked the idea of creating something that included a picture frame, so they could pop their favourite picture of the two of you into it afterwards. We played around with a few different variations until we found one that was just the right size and depth and would hold a pretty arrangement while also allowing us to personalise the gift with a message from you. Eventually we settled on this pretty box frame in a light grey colour, which complements the vibrant blooms beautifully. 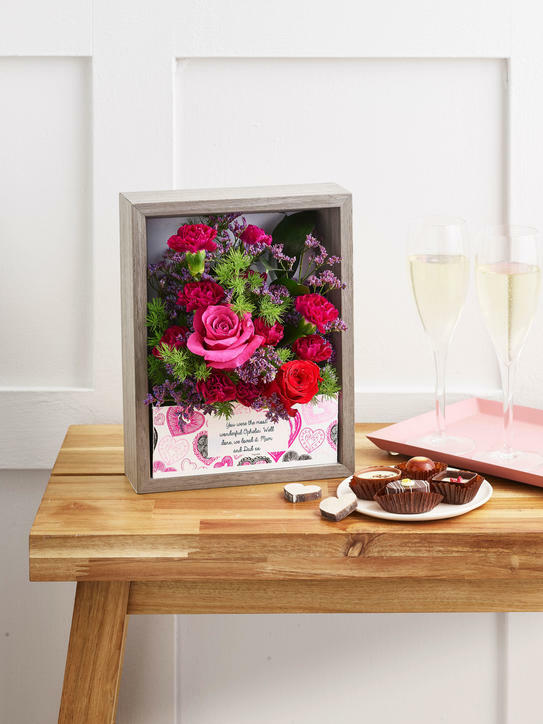 As with all our gifts, these Flowerframes are ideal for a whole range of occasions. They’re the perfect gift to send to someone who has just had a new baby – Mum can pop a picture of her new tiny bundle into the frame, or even of her new tiny bundle's tiny toes! They also make a great gift for a friend you haven’t seen for a while, just to let them know you’re thinking of you. Why not email them a picture of the two of you together that they can print out and pop into the frame once they’ve received their gift? And of course, they’d made a great alternative to the traditional bouquet for a birthday. There are a whole range of pretty arrangements to choose from, including germini and rose, Miss Piggy Dutch rose and carnations and a gorgeous combination of lilac, lime santini and cream carnations. Something for every taste and sensibility. We hope you love them as much as we’ve loved creating them!